An international research team led by the Research Institute of the McGill University Health Centre and Lund University has provided new evidence that aortic valve disease may be preventable. The findings show that so-called “bad” cholesterol or low-density lipoprotein-cholesterol (LDL-C) is a cause of aortic valve disease – a serious heart condition that affects around five million people in North America and is the most common cause for valve replacement. 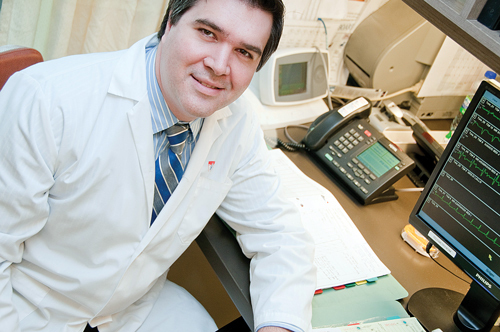 An international research team led by the Research Institute of the McGill University Health Centre (RI-MUHC) and Lund University has provided new evidence that aortic valve disease may be preventable. The findings show that so-called “bad” cholesterol or low-density lipoprotein-cholesterol (LDL-C) is a cause of aortic valve disease – a serious heart condition that affects around five million people in North America and is the most common cause for valve replacement. The study, published in the Journal of the American Medical Association (JAMA) and presented at the Canadian Cardiovascular Congress in Vancouver, could have major implications in the prevention of heart valve disease, a condition that currently has no known medical therapy. The study involved approximately 35,000 participants in the Cohorts for Heart and Aging Research in Genetic Epidemiology (CHARGE) consortium – a large international collaborative. Researchers discovered that genetic predisposition to elevated LDL-C was associated with the presence of aortic valve calcium and narrowing of the aortic valve; thus supporting a causal association between LDL-C and aortic valve disease. “Our next step calls for new randomized trials, maybe using one of several new LDL lowering agents, in the earliest stages of valve disease before we are able to confirm our hypothesis,” says Dr. Thanassoulis. The statement in the JAMA article “providing evidence supportive of a causal association between LDL-C and aortic valve disease” seems to me far removed from the journalist’s interpretation “low-density lipoprotein-cholesterol (LDL-C) is a cause of aortic valve disease”. There are numbers opposing views and studies about cholesterol and its link to CHD… For instance I read some article about “LDL-C : The Other “Good” Cholesterol?” by Dr. Nevile Wilson in which further reading states that LDL-C isn’t so bad after all. And we have this study that further assert the link of LDL-C aortic valve disease. Sometimes its kind of a bit confusing which would the more accurate views to follow when it comes to cholesterol and their link to CHD.